If you don't like Guardian Heroes' HD makeover, changing to the original graphics is only a button press away. Sega Saturn games are rarely ported due to how hard the games are to emulate. Even though bedroom programmers get Wii games to play in HD on their laptops, there hasn't been much success with Saturn emulation. So, it's a welcome surprise to hear that Guardian Heroes for XBLA won't only include the original in its entirety but will also allow players to switch between the original and the revamped HD graphics on the fly (a la the Monkey Island rereleases). It was also recently unveiled that Treasure, who also developed portable sequel Advance Guardian Heroes, will lend a hand to this rerelease. "Saturn code is notoriously difficult to work with so getting that original developer was really key to making this project happen," a Sega representative told Destructoid. 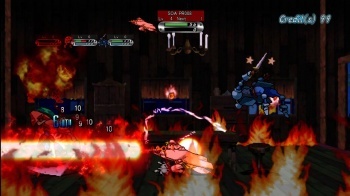 In addition to HD graphics, the original story and versus modes, players can also look forward online co-op with two players, a 12-player versus mode, time-attack mode, arcade mode, and "arrange" mode, when Guardian Heroes arrives on XBLA for 800 Microsoft Points later this summer. The original 1996 release of Treasure's brawler-RPG hybrid Guardian Heroes was one of the few games that made the Sega Saturn worth having. It's also one of the few games to go for over $100 on eBay, which is part of the reason why The Escapist readers were ecstatic over news that a HD re-release would hit XBLA later this summer.